Tough Speed stands at stud in Tasmania after a solid racing career in the UK where he won at two before scoring at Group 3 level over a mile in England. Tough Speed was also competitive in top company, including a placing in Group 2 company at Royal Ascot. Tough Speed has built a reputation for toughness and talent with his breeding stock with his progeny including stakes winners BANCA MO, BLACK ‘N’ TOUGH, LYELL, TIESTO and TOUGH CHIK. 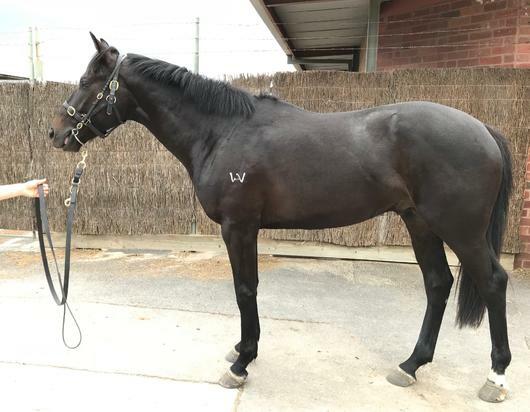 This gelding is out of the unraced ROCK OF GIBRALTAR mare French Lace, who is a daughter of the stakes winner ALLEZ FRANCE and a sister to the two-year-old stakes winner SUPERFLY. French Lace has had four foals to race and all are winners, including TIESTO, a stakes winner at two while the mare’s stock has all shown speed with wins up to 1400m. TOUGH SPEED (USA) (Bay 1997-Stud 2004). 3 wins-1 at 2-at 7f, 1m, Doncaster Park S., Gr.3. Sire of 171 rnrs, 100 wnrs, inc. SW Black 'n' Tough (TTC Newmarket H., L), Banca Mo, Tiesto, Tough Chik, Lyell, SP Jay Bee's Gee Gee, Miss Two Pairs, Wyuna, Perplexing, Settler's Joy, Buzzing Along, Speedy Sky and of Miswaki Call, Royal Miswaki, Street Tough, Chief Navigator, It's a Battle, Mag Wheels, Speedonova, White Hawk, Hell Baby, Speed Force, etc. TIESTO (g. by Tough Speed). Winner at 2, A$118,507, in 2017-18, TTC Gold Sovereign S., L, 2d TTC Magic Millions 2YO Classic, Meander Valley Council 2YO P., 3d TRC WL Shields 2YO Autumn Sprint. French Dandy (f. by Moshe). Winner at 1350m in 2017-18 in Aust. Missy Molace (f. by Uncle Mo). Winner at 1400m in 2017-18 in Aust. Wild Boys (g. by Choisir). Winner at 1400m in Aust. Flying Envy. 2 wins at 1000m, 1100m in Aust. Cape Wickham. 3 wins-1 at 2-at 1300m, 1400m to 2017-18 in Aust. Cai Poh Wang. Winner at 1600m, 2d Singapore TC Super One S., 3d Singapore TC Inglis Ready2Race S., Kranji S.
Solid Effort. 4 wins from 1600m to 2000m, 2d AJC Sadleir 2YO P., STC Tooheys New H.